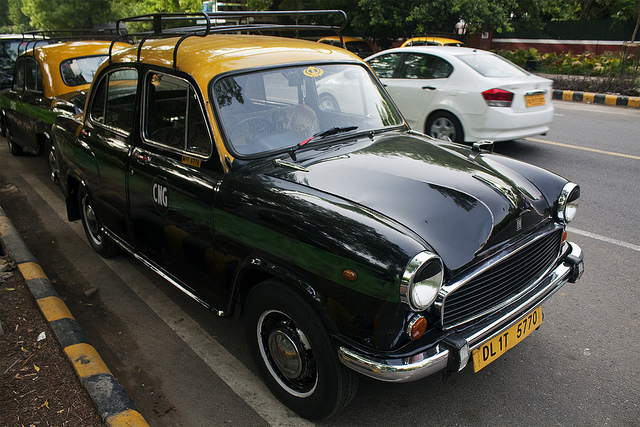 A taxicab running on compressed natural gas in New Delhi. Photo by Luke X. Martin. In India, the Gujarat High Court has ordered the state government to convert all public and private vehicles registered in the state to compressed natural gas (CNG) within one year. These recent orders are from a hearing over a petition received by the High Court from Dhanghdra Prakruti Mandal, an environmental NGO, claiming pollution levels in Ahmedabad, Gujarat were on par with those in New Delhi and Mumbai. The petition argued that it was a discriminatory practice for the central government not to provide a reduced price on the cleaner burning fuel to Gujarat-based city gas distributors, despite Ahmedabad’s clear need for it. At the end of the judgment, the High Court also said that if the order for all vehicles in the state to run on CNG was not enforced within a month, strict restrictions would be passed to fix emissions levels to international standards. The court has also directed the central government to offer natural gas, including CNG, to the city of Ahmedabad at the same price it supplies the fuel to New Delhi and Mumbai under the Administered Price Mechanism (APM). Gas pricing in India is set in two ways: APM and free market. The price of APM gas is set by the government and subsidizes fuel meant for fertilizer, power, and city gas distributors. APM is also used to lower prices on CNG in Mumbai and New Delhi and has allowed CNG prices in New Delhi to be as low as Rs 38.35 (US$0.69) per kilogram, while the cost for the same in Ahmedabad is at market price, or Rs 53 (US$0.96). However, one year may not be enough time to set up the infrastructure required for the entire state’s vehicles to run on CNG. It will surely trigger petitions of its own in response, as the upfront cost of car conversions and infrastructure will be significant. However, if successful, it could force auto manufacturers to increase their production of CNG vehicles to feed the market in Gujarat, which could mean higher sales across India. Recently, Saurabh Patel, Gujarat’s Minster of State for Energy, stated the government would place vehicles and small industries at a higher priority for receiving CNG resources, while larger industries would only receive surpluses. Natural gas is available in two forms: Compressed Natural Gas (CNG) and Liquid Natural Gas (LNG). CNG can be used to power cars, but comes with pros and cons. While the court’s directive may seem like a good move towards clearer air in the state, it is based on a controlled comparison of gasoline versus CNG, which shows that CNG reduces carbon monoxide by more than 90 percent, emits 20 percent to 3o percent lower levels of greenhouse gases, and cuts carcinogenic pollutants and non-methane hydrocarbon emissions. It fails to consider, though, the impact of other emissions, engine technology, and the lifecycle costs of vehicles. The initial conversion is costly. Additionally, it requires adequate and properly placed pumping stations. Converted cars’ engines may not last as long as non-converted cars, and they will also need to give up a significant amount of trunk space for new fuel tanks. All things considered, CNG may not really be the best fuel option for urban transport. Bajaj's RE60: A Four-Wheeler, But Not a Car?